Department of Art | Doodle Cart & Doodle Bike Blender Visit Georgia, Virginia and North Carolina. Home » News » Doodle Cart & Doodle Bike Blender Visit Georgia, Virginia and North Carolina. Doodle Cart & Doodle Bike Blender Visit Georgia, Virginia and North Carolina. Doodling and blending at Tift Park Community Market. FSU Art Professor Paul Rutkovsky gave a lecture about his current projects: Art Alleys, Doodle Cart, and The Plant at Albany State University, Georgia, April 3rd. Saturday April 4th, Rutkovsky, the Doodle Cart, and a new addition, the Doodle Bike Blender, were at Tift Park Community Market in Albany. 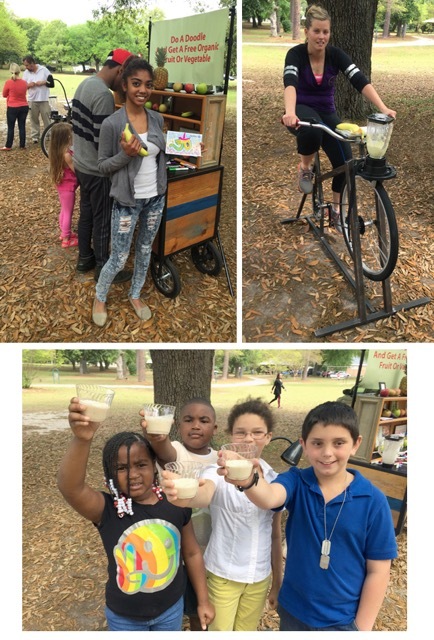 The Doodle Cart and Doodle Bike Blender will be at Radford University in Virginia April 24 and the Hendersonville Food Cooperative in North Carolina April 27.